Giving the gift of Android is a magical thing. And from the looks of the newest report from Flurry Analytics, there was plenty of magic happening last Sunday. According to Flurry, activations for Android and iOS devices jumped 353% on Sunday and reached an amazing number of 6.8 million in a single day. With a huge boost in activations, it doesn’t take an Android engineer to figure that app downloads will also go through the roof. 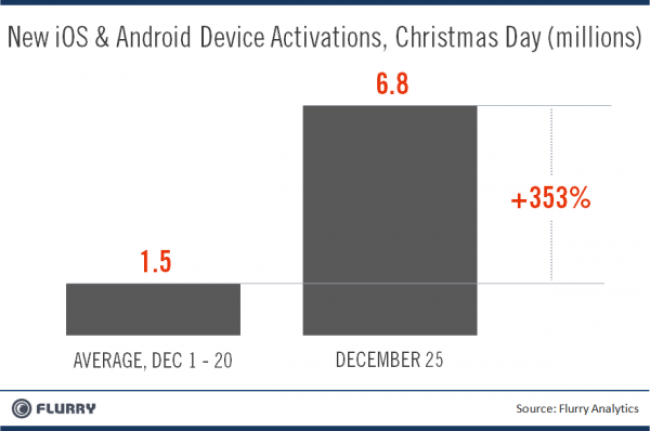 A record 242 million apps were downloaded through the iOS and Android markets on Christmas Day. Now, let us hope that all of those new lovely Android owners find their way here to DL. Tuesday Poll: Who is your favorite Android phone manufacturer today?